I Want this or one of these Drawers!!!! ALEX = $119 (6 drawers on coasters) "This drawer can go anywhere!! I like it a lot!" 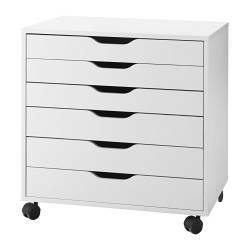 ALEX= $119 (drawer unit 9 drawers) "You know how much makeup and junk I could put in there!! LOL"
a drawer on wheels, i DEFINITELY need one of those to organize my stuff! I love IKEA but I currently just have my makeup up in pouches and a plastic container...lol.